Earn up to 260 MountainPoints. 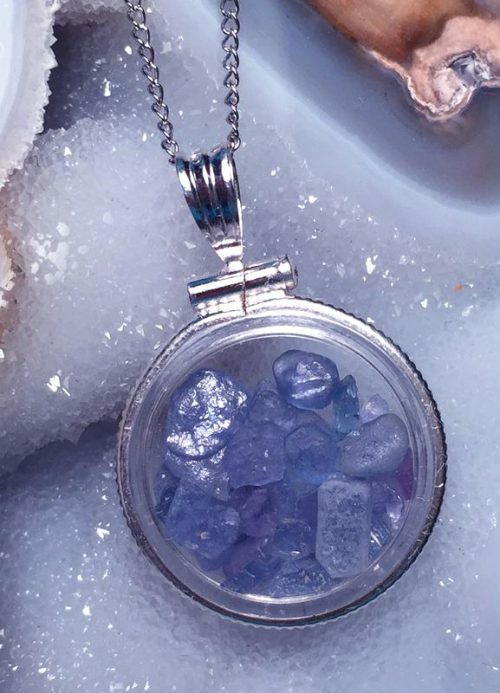 Montana Yogo sapphire locket pendant available in sterling silver or gold filled. 3 1/2 cts of rough yogo sapphires, locket is just under 3/4″ across. Comes with an 18″ chain. Natural in color, unheated, untreated stones from Yogo Gulch, Montana, USA Comes with a Certificate of Authenticity in a quality box. All items will be shipped through the US Mail First Class and will be insured. We use the U.S. Postal Service for all shipping. First Class shipping is free on all items worldwide. Free First Class Shipping in the U.S. usually takes 3-5 days, but can take longer. We will accept returns within 14 days. Merchandise must be received by us in the same condition as it was received by you. Refunds are for purchase price minus $10 or actual shipping cost if higher than $10, restocking fee , which will be refunded on your next order. There is no restocking fee on exchanges. If you order more than one item and only make a partial return, there is no restocking fee.